I took delivery this morning of a box and too my surprise, I realised it was my own sports jacket that had been finished by my tailor in London. I started this jacket last summer and took the forward fitting out to show when we where invited to Beijing, China last September for a luxury goods expo. However as we have been so busy we couldn't get the jacket finished, as obviously the customers always come first! I'm looking forward to getting this back from the finisher next week and having it ready for our March USA trip and if I get a chance I will take another couple of photo's after the hand button holes are in and it's buttoned and pressed. 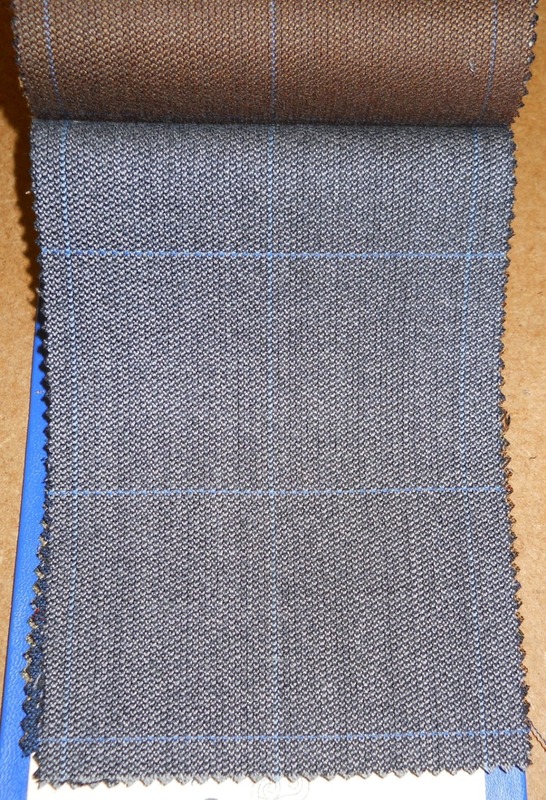 What I like about this cloth from the Porter & Harding (Harrisons), Glorious Twelve bunch is its flexibility and we have made up nearly the whole bunch for customers over the years. This one of mine is the 25341. 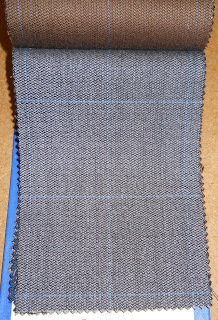 It is a grey barley corn weave with a blue over-check and although I have had it made up as a sports coat, I may end up following the lead of a customer of ours who had it made up as a sports jacket originally and then decided a 2-piece suit will work as well so we made the trousers up for him and it looks fantastic. That's the great thing about this bunch, it is a good weight with it being 11oz so it suitable for 3/4 of the year in most climates and most of the patterns work well as sports coats and suits depending on the occasion. I'm going to be using my jacket as a more casual sport jacket to travel in and to go out for meals as it looks equally great with jeans or grey flannels with a nice Oxford blue shirt and black or brown shoes and even for the most daring of people, white trainers/sneakers. Looks terrific Matthew. The sport coat that you and Edwin made up for me with this cloth is fantastic. Enjoy! Thanks Eric, Glad you are still enjoying the coat! Can't wait to get plenty of wear out of mine!